Nursing Factor™ is recommended for improvement of the quality and the quantity of milk in nursing mares. 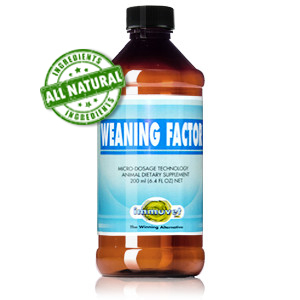 Nursing Factor™ is a nontoxic and completely free of any side effect product developed to increase the production of milk in the mare. Nursing Factor™ is an ideal combination of compounds intended to provide necessary elements for increasing the production of milk in the mare. 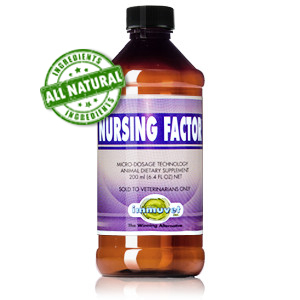 The diluting-mixing process assures a rapid action of Nursing Factor™ and renders it totally nontoxic and completely free of any side effect. Shake bottle vigorously 10 times before drawing 10ml dose (every time you use it). Give your mare 10ml of Nursing Factor™ on an empty stomach first thing in the morning 10 days before the expected due date and then during 10 more days after foaling. Keep this product away from sources of energy, heat and light. Do not mix different products in the same syringe. Orders before 2PM(Eastern) usually ship same day.